From what I have seen thus far, the 2014 Panini Elite set packs a punch with action-filled images. I’ve already shown off the cards of Bryce Harper and Dustin Pedroia that I have picked up from this issue. And I am really starting to like the ‘E’ backdrop that Panini has used with the graphic package for this set. 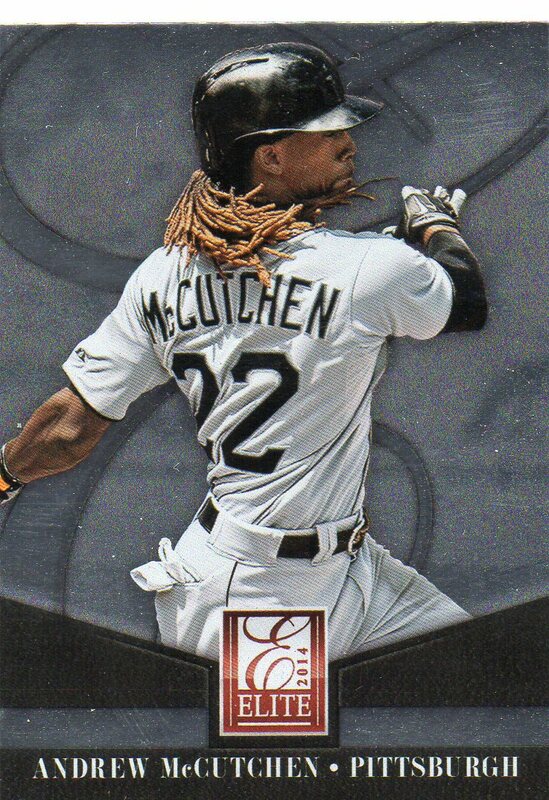 I will say that I wish McCutchen’s uniform had some Yellow accents on it as that would add a drop of color that I think the card is missing. Other than that, I am digging it! I scooped up a relatively small stack of cards from the newly released 2014 Donruss Series 2 set two weeks ago. All modern players, you better believe that I snagged the card of the reigning NL MVP for my collection. I like the action on this one – it shows that powerful back-swing that we have grown used to seeing from McCutchen. As for the cards itself, since it follows the exact design as the Series 1 issue, I still see way too much of a mix between 1984 Donruss, 1987 Donruss, and even 1978 Topps. I am almost 100% done going after cards from the 2014 Topps Allen & Ginter baseball card set. Unless I come across some of the more limited print cards of the main guys that I collect, I have no plans to keep shopping for cards from the set. During my last purchase of cards from Sportlots.com, I did grab a few that I did not obtain during my primary A&G buy. 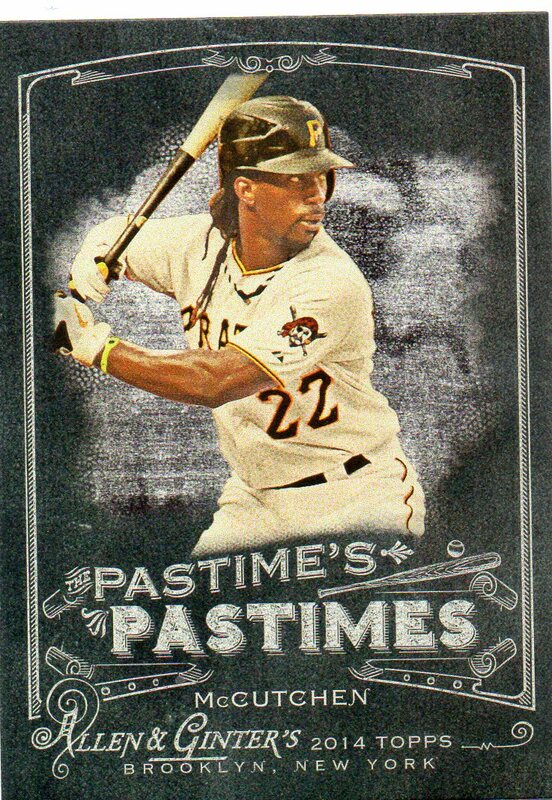 Among that lot is this sweet card of Andrew McCutchen from the ‘Pastime’s Pastime’ subset. 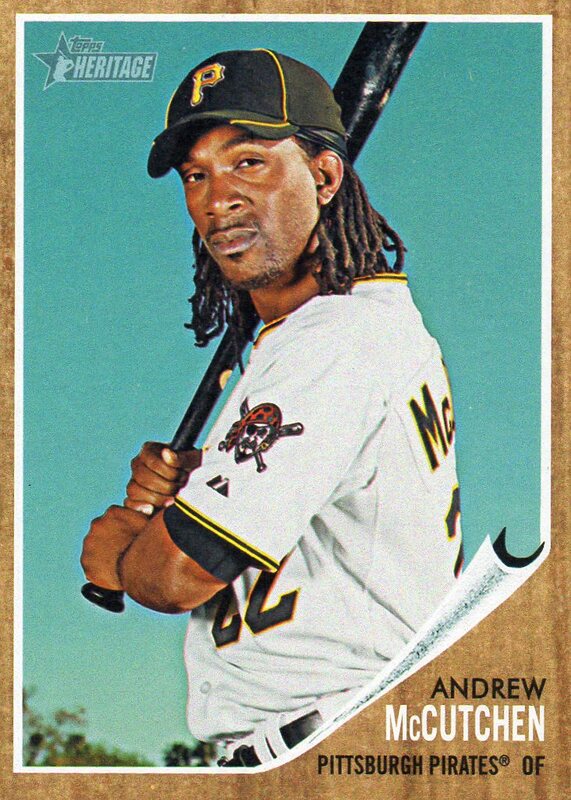 Andrew McCutchen celebrates his 28th birthday today. One of baseball’s brightest young stars, and the heart and soul of the Pittsburgh Pirates, Andrew McCutchen is a player that can do it all. 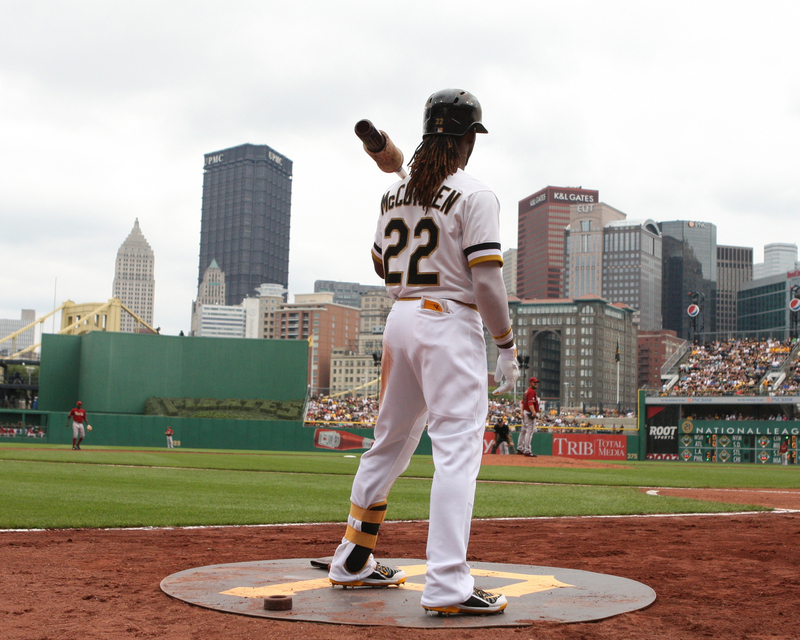 From hitting to fielding to running, and everything in between, McCutchen excels at it all. And with two consecutive postseason appearance in a row, he takes his entire team along for the ride. Having just completed his 6th big league season, McCutchen is already a 4-time All-Star, Gold Glove winner, Silver Slugger winner, and league MVP. The sky is truly his limit. 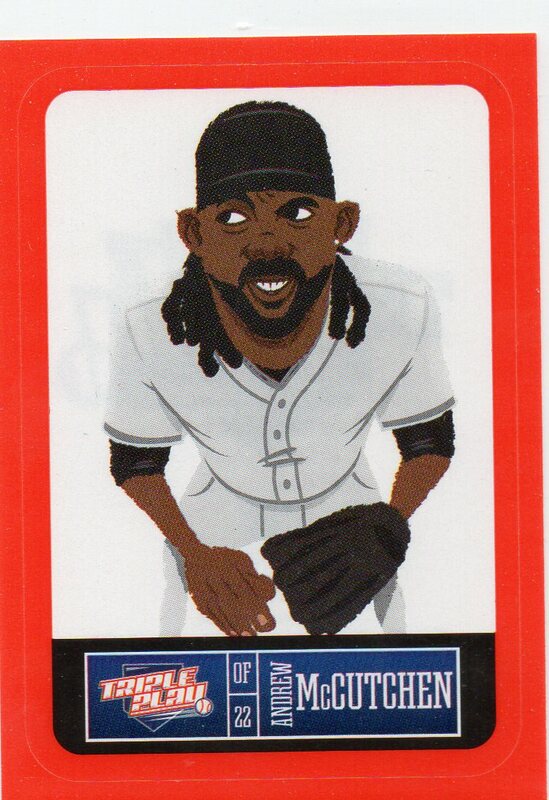 Andrew McCutchen 2011 Topps Heritage – A Thing Of Beauty!!! Sometimes you don’t need a lot of words to explain the value and beauty found in a work of art. I will let the cardboard do the talking. 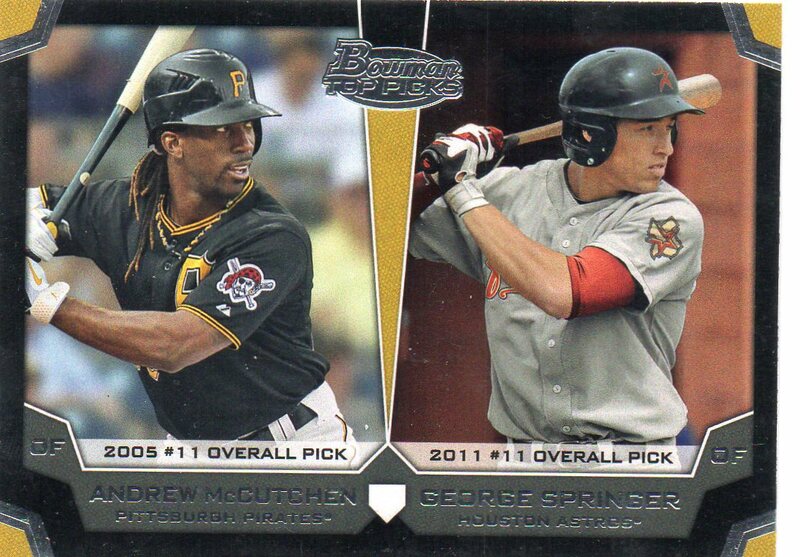 These side-by-side Bowman ‘Top Picks’ cards are pretty neat. The cards offer a fun way to compare recent draft picks, and ultimately see which teams have solid foundations for the future due to good drafting and which teams do not. Both the Pittsburgh Pirates and Houston Astros seem to be getting it more right than wrong as both teams have shown signs of promise with their young talent taking center stage. 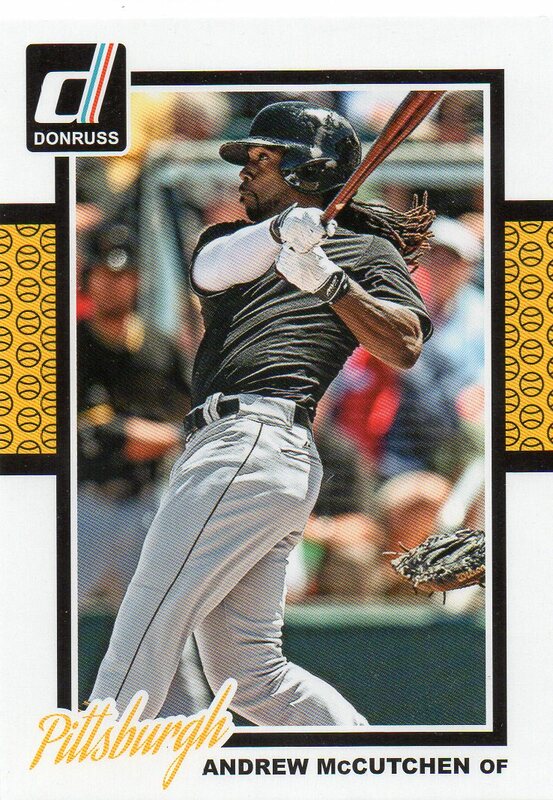 This is the second of two cards, stickers, that I picked up of Andrew McCutchen from the 2013 Panini Triple Play set. And, again, while something I would not purposely focus on adding into my collection, as an accessory for just $0.18 each, it is a nice addition. Featuring the same image, cartoon, as the card I showed off a few weeks back, this one has a Red border and lacks some of the graphic elements that the base card brings. Other than that, it’s almost identical.